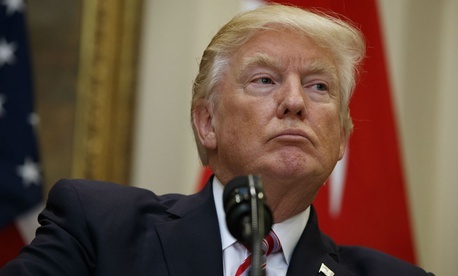 Conflict-of-interest controversies continued to swirl around the Trump White House as the Office of Government Ethics rejected a Trump attorney proposal for financial disclosure and Democratic lawmakers demanded clarifications of appointee ethics waivers and Trump hotel profits. Trump’s private attorney Sheri Dillon, according to a story broken Friday by the Associated Press, in late April had proposed in a face-to-face conversation with ethics office Director Walter Shaub that Trump withhold his signature on initial versions of his voluntary financial disclosure form now under preparation. The signature certifying that the information is true wouldn’t come during the early consultation process with OGE. On May 10, Shaub wrote back saying, “OGE will provide this assistance on the condition that the president is committed to certifying that the contents of his report are true, complete and correct. I agreed with your analysis that he is not legally required to file, but I indicated that OGE would be unwilling to certify a report that failed to meet the requirements generally applicable to public financial disclosure in the executive branch.” The ethics office will offer advice, Shaub continued, only if all parties agree that he will certify his report. Though AP obtained the correspondence under the Freedom of Information Act, the Shaub letter has since been posted on the OGE website. Separately, on Monday, eight House Democrats on the Oversight and Government Reform Committee wrote to Shaub urging him to continue his earlier quest for the White House to release copies of all the waivers to conflict-of-interest rules that it has granted to presidential appointees. Led by ranking member Elijah Cummings, D-Md., the Democrats noted a New York Times report that the White House has declined to identify former lobbyists who have been given waivers to work in federal agencies. Also reported on Monday was a letter from White House Budget Director Mick Mulvaney to Shaub asking him to “stay the data call” for reports on ethics waivers granted because of unresolved legal questions. The House Democrats also listed a series of lawmaker letters the White House has declined to answer. Separately, Trump’s unusual arrangement to continue ownership of the federally owned building now housing the Trump International Hotel in Washington drew a blast on Monday from Sen. Patty Murray, D-Wash.
At a Jan. 11 news conference, Trump had said he would forward to the U.S. Treasury any profits from foreign government guests at his Washington hotel. Critics have filed lawsuits charging that Trump’s continued ownership of the hotel violates the Emoluments Clause. A White House spokesman referred queries to attorney Sheri Dillon, who did not respond by publication time.